Definition - What does Elephant Trunk Pose mean? Elephant trunk pose, otherwise called eka hasta bhujasana in Sanskrit, is a challenging arm-balancing yoga pose. It's also called one leg over arm pose. To enter the elephant trunk pose, sit down with the legs stretched as one would in staff pose. Bring the right shin toward the body and place the right foot on the floor by the side of the left knee. Hold the right foot with the left hand and lift the leg off the floor. Slide the right arm under the right leg so that the inside of the right knee is placed on the upper right arm closer to the shoulder. With the palms placed on the floor, lift the body off the floor. Remain in the elephant trunk pose for 20 seconds. 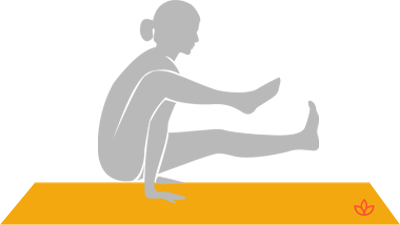 Repeat the same sequence with the other leg. Beginners can practice elephant trunk pose with the support of blocks. Place the blocks by the sides of the hips. Sit on a cushion that is level with the blocks. Place the palms firmly on the blocks then lift the hips and the extended leg off the floor. The benefits of elephant trunk pose include strengthening the arms and wrists, promoting core strength, stretching the hips, improving balance, energizing the body and mind, and boosting inner strength. Those with wrist, arm, shoulder or hip injury should refrain from practicing elephant trunk pose. Those with chronic back conditions should also avoid practicing the pose.